Luxury watches have always been something to invest in and, at present, one is spoilt for choice with the large variety of sleek, deluxe yet minimalistic chronometers made available by top-notch brands. Nonetheless, the ultimate allure of flaunting a watch is the ability to make a statement; a unique first impression. So, even though luxury watchmakers have built strong reputes on fine workmanship and precision over decades, there simultaneously exists a superior class of craftsmen vying for a part in the worldwide watch roar by fashioning innovative, peculiar, one-of-a-kind masterpieces. 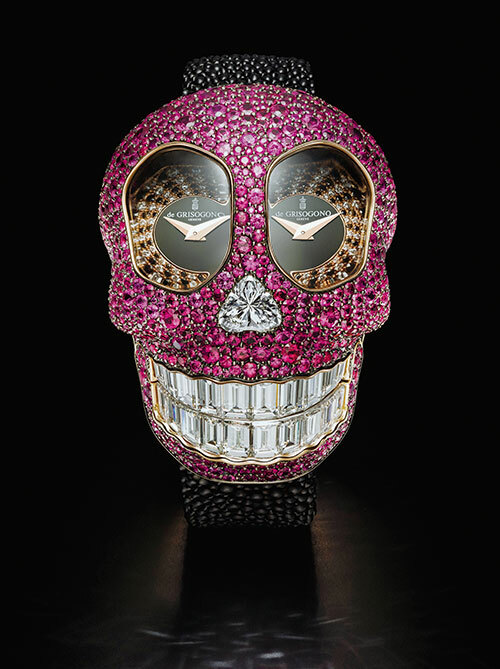 De Grisogono certainly makes a cheeky statement with its flamboyant Crazy Skull watch. Hollow eye wells set with spellbinding diamonds lure the eye toward two distinct dials which display dual time zones. Owing to an intricate bespoke mechanism wholly conceived and created by the brand’s master jewellers, the mouth is set with 7.70 carats of invisible-set white baguette-cut diamonds. What’s more, when the lower jaw is triggered, the Crazy Skull sticks out its tongue — set with 66 pink sapphires or rubies! “Creativity is a pure expression of passion.” – Fawaz Gruosi, founder of De Grisogono and creator of the Crazy Skull timepiece. Introducing a new legend to its Collaborations collection, RJ-Romain Jerome commemorates Gotham city’s Dark Knight with the Batman-DNA timepiece. Housed in a black PVD-coated steel case, the bezel has been machine-worked to represent the angular contours of the Batmobile. 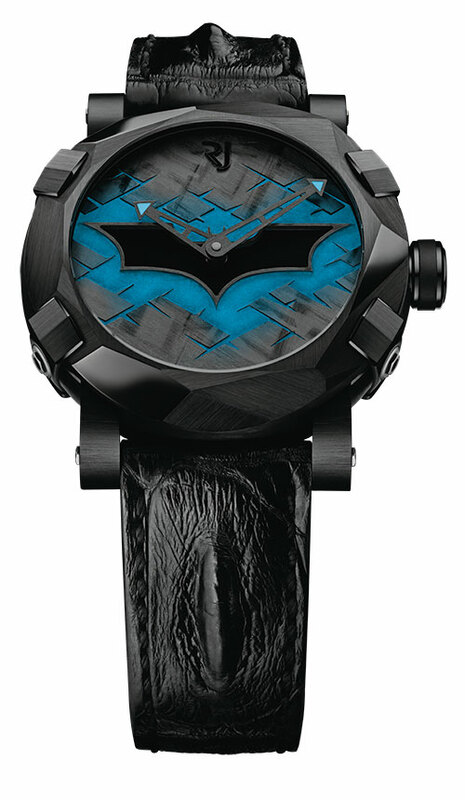 The dial of the watch features a striking Batman emblem applique and the legendary Bat-Signal glows in the dark thanks to the black SuperLuminova filled in the engraving, outlining the hero’s famous symbol. 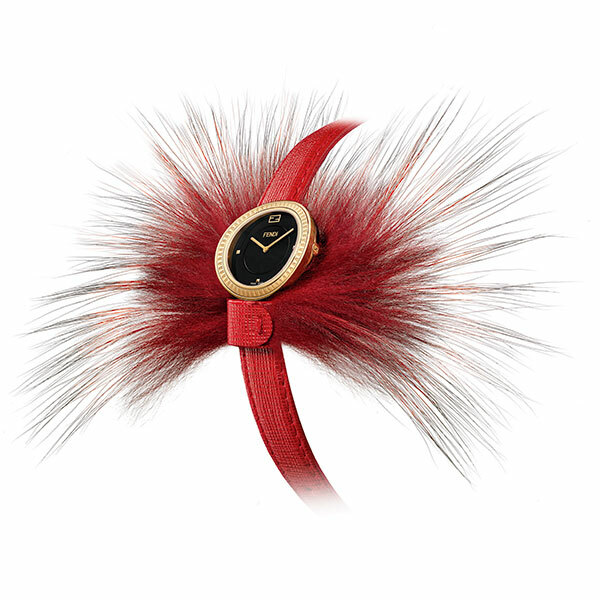 Among Fendi’s classy and stylish timepieces is the Fendi My Way watch, which comes with a removable fox fur plume, that adds a dash of glamour to it. The calfskin leather strap features a dual-colour effect, and the watch has a curved case design in yellow, two-tone or rose gold steel or stainless steel. Available in petite and large sizes, this model is a quirky blend of fashion and refinement. A record-setting jump from way up in the stratosphere is certainly worth celebrating, and Zenith does a fine job of it with the Academy Christophe Colomb tourbillon which is a tribute to the world’s first and only skydiver to break the sound barrier — Felix Baumgartner. The dial illustrates Baumgartner right before the jump, the turquoise part of the dial depicts the Earth, and the aventurine upper part represents the Milky Way. In honour of the legend of King Arthur and his knights, the Roger Dubuis Excalibur Round Table watch features a design which comes from a reproduction of the Arthurian Round Table that was made for King Henry VIII and placed in the Grand Hall of his Winchester Castle. 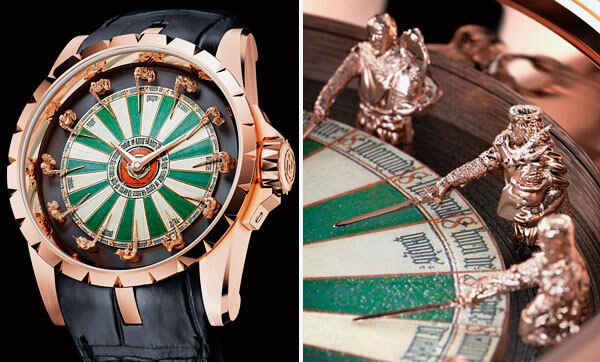 The vibrant dial of the watch sees 12 sculptural gold knights positioned at each hour marker, their swords drawn valiantly, while the caseback has a circular engraving of the solemn oath of the Knights of the Round Table and a lacquered Coat of Arms. The Margot watch from Christophe Claret made quite a mark on the world of horology last year, having been honoured as the Best Ladies Watch Award at the Salon Internacional Alta Relojeria 2014. Dainty and appealing on the outside, the watch reveals a remarkable complication on the inside…fuelling an exciting game of romantic roulette. 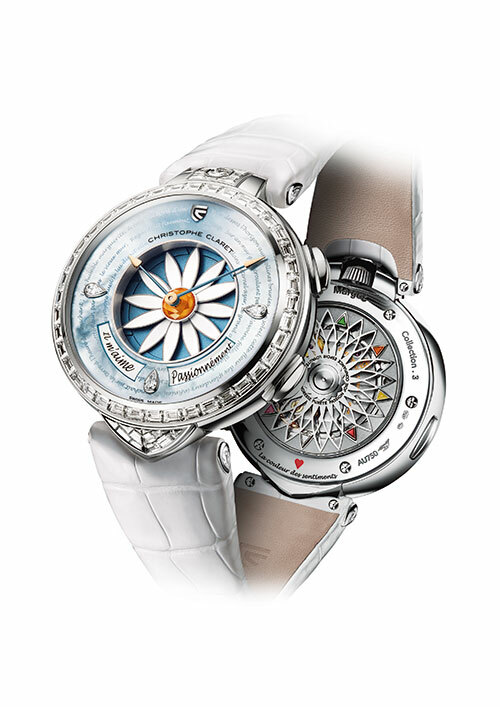 Press the button at 2 o’clock and one or two of the 12 white, satin-lacquered titanium petals fold away at random, revealing the answer to the question ‘Does he love me?’ in the windows below. 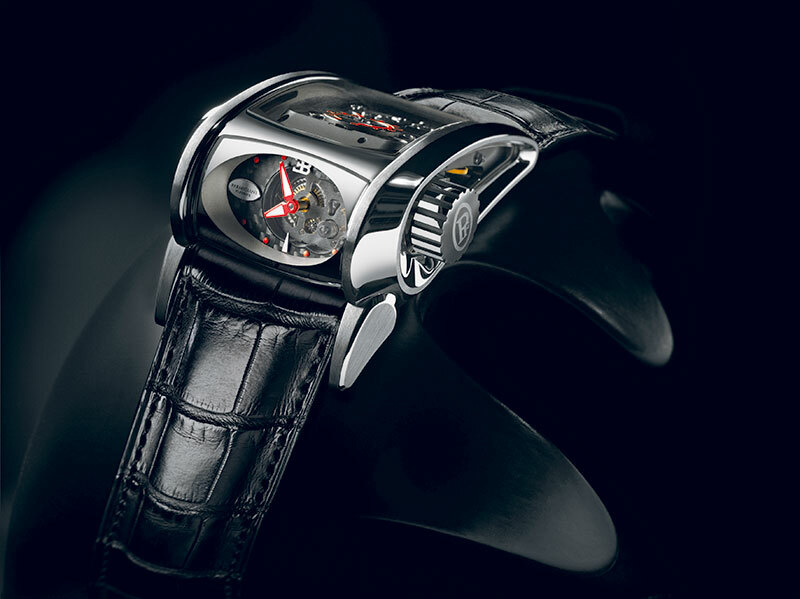 Teaming up with high-performance automobile manufacturer, Bugatti, Swiss watchmaker Parmigiani Fleurier dramatically heightens watch design and engineering with the Parmigiani Bugatti Super Sport. The watch is designed in a way that the dial faces the wearer at an angle on the wrist, while the top façade offers a view of the movement and power reserve indicator. Finished in gorgeous black tones with a hint of orange, the new Parmigiani caliber PF 372 movement can be observed through six different sapphire crystals. Quirky watches may be fast catching on as a trend lately, but this isn’t an entirely novel concept. Around 30 years ago, Swiss watchmakers quickly picked up on the appeal created by Swatch — which first kicked off the fashion-watch phenomenon in the 1980s, teaming up with artists like Keith Haring and Kiki Picasso to create collections inspired by popular culture. 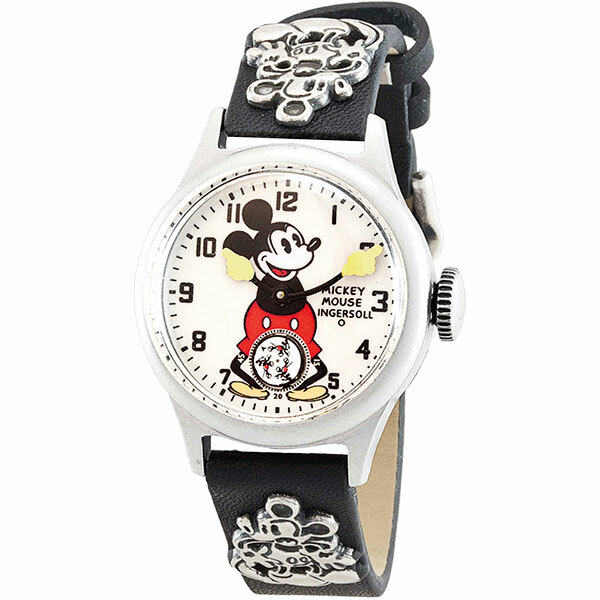 Still, no other unconventional timepiece possesses the antiquity and lore of the 1933 Ingersoll Mickey Mouse wristwatch. In 1932, a fiscally-doomed Ingersoll-Waterbury Co affiliated with The Walt Disney Company to create the watch and, in 1933, the first pieces were made available. An unprecedented 11,000 watches were sold by department store Macy’s in just one day, more than 2.5 million pieces were sold by 1935…and the Ingersoll Clock Company was saved from bankruptcy. Baby G watches are back with a bang! Here, megastar Rihanna flaunts several Casio Baby-G and mini G-Shock watches in the music video for her song Rude Boy. 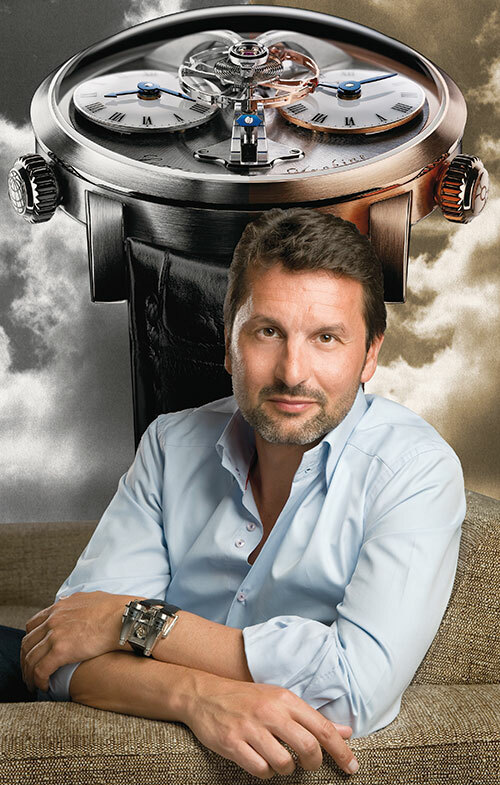 Maximilian Büsser looks like he just stepped out of the cockpit of a plane as he sports his own aviation-inspired creation, the MB&F Horological Machine No4 Thunderbolt. Supermodel Karlie Kloss proudly brandishes her De Grisogono Crazy Skull watch in Paris, even sharing a picture of the unusual timepiece on her highly popular Instagram account! According to you, what is the appeal of a quirky watch as opposed to a classic or traditional timepiece? While both kinds of watches have a statement to make in their own right, I find quirky watches more exciting simply because they stand out. A quirky watch goes a very long way as a conversation starter and can add a lot of fun to an otherwise conservative outfit. 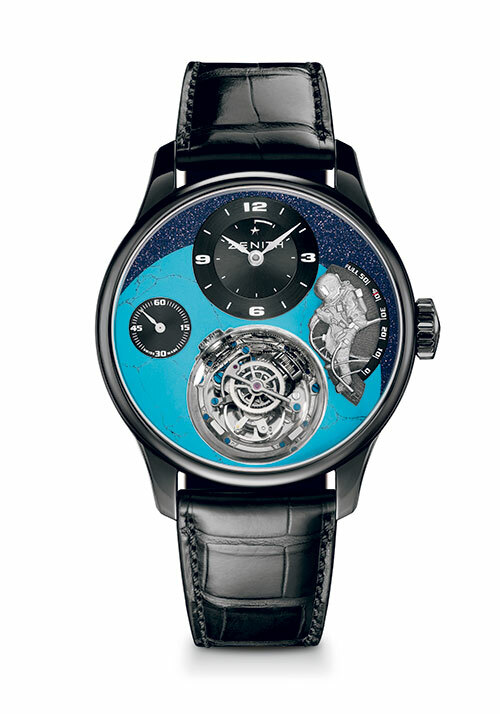 If you had the chance to design your own unusual watch, what would you love to do to it? I’m all about prints, so perhaps I’d like to create a cool watch with funky roosters on it. Actually, I already have a design in mind! Who do you think pulls off a quirky look very well? I find Johnny Depp to be pretty amazing with the quirky look. He can pull off just about anything. 1. Always keep the timepiece as the centre of attraction. 2. Let the watch decide the clothes you wear. 3. Make sure that any other accessories you wear are the same colour as your watch.